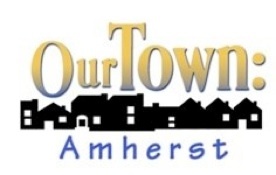 WNED’s latest episode of “Our Town” shines the public television spotlight on Amherst! This television series is a video scrapbook of the people, places and happenings of Western New York and Southern Ontario towns as seen through the eyes of their residents. This program was broadcast WNED-TV on Sunday, April 15 at 5 p.m. to learn why Amherst is a unique, historic and special place to live, work and play. 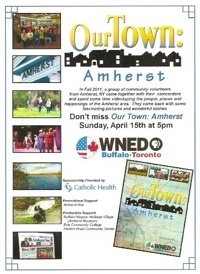 Because of the buzz in the community about the broadcast premiere of Our Town Amherst on April 15th. Another broadcast was added to the WNED schedule on Monday May 7th at 10:00 PM. In the Fall of 2011, a group of volunteers from Amherst, New York took to the streets to help produce "OUR TOWN: AMHERST", a video scrapbook of the people, places, and happenings of their community. Their images, stories, and personal comments combine to make a most memorable program. Volunteer Lois Shriver chose to profile Amherst State Park in her segment of the program. 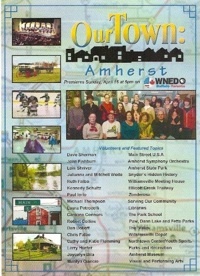 OUR TOWN AMHERST premiered on WNED-TV in April 2012. The video below is her segment about Amherst State Park from the program.